Juice Rap News – the online comedy rap current affairs phenomenon that rhymes the News with true views to restore your faith in the Fourth Estate. 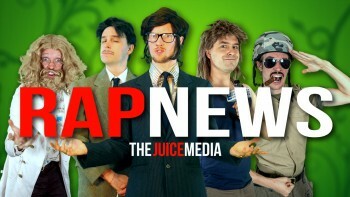 A fusion of biting satire, rigorous academic research, anarchic home-made costuming, and deftly-performed rap rhyming, Juice Rap News is a cult success story of the interwebs which quickly garnered a loyal online following, racking up over 12 million views over 30 episodes, and featuring cameos with icons and influential figures such as Julian Assange, Noam Chomsky, Normal Finkelstein and Senator Scott Ludlam. The hard-hitting and hilarious news show broadcasts free on YouTube and is created by Giordano Nanni and Hugo Farrant, who combine their skills of philosophy, historical perspective, comedy and rap together into a unique and addictive brew. The team are now working on Season 4 of the series, and are looking forward to opening more people’s eyes to the truth of the show’s slogan: History Is Happening.